World Taekwondo Grand Prix live on the BBC Red Button, Connected TV and on the BBC Sport website: Saturday 25 October 19:00-22:00 BST, Sunday 26 October 18:00-19:58 GMT. 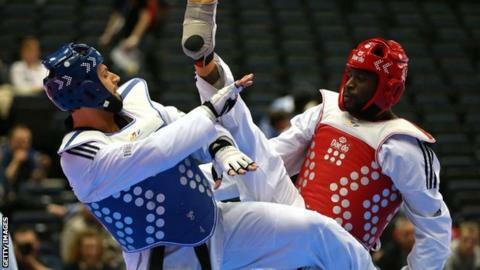 British fighter Mahama Cho failed to defend his heavyweight title at the World Taekwondo Grand Prix, after a second round defeat in Manchester. Cho, 25, was born in the Ivory Coast, but moved to the UK at the age of eight to escape bullying and was taught taekwondo in order to protect himself. He lost in sudden death to Olympic champion Carlo Molfetta of Italy. Team-mate Jade Slavin reached the last eight but lost to Serbia's +67kg London 2012 gold medallist Milica Mandic. Cho represented Britain at the 2011 World Championships in South Korea but after missing out on the London 2012 Olympic squad defected to France. He won titles in the United States and Netherlands in early 2013 before being enticed back to the GB programme. Since then the fighter has risen to number four in the global standings after winning medals at each of the previous three World Taekwondo Grand Prix events. As my rankings has gone up more people have learnt about my style and how to fight against me," Cho told BBC Sport. "A lot of people are looking to do that tactical fight now, but that's something I can work on and try and few different things next time." Germany's Volker Wodzich beat Uzbekistan's Jasur Baykuziyev to win the men's +80kg division, with Russian Anastasiia Baryshnikova taking the women's -67kg title. Slavin's conqueror Mandic went on to claim the women's +67kg heavyweight crown, but the British fighter was delighted by her performance. "I'm really proud of myself that I won two fights and only lost to the world number one," said Slavin after beating Melda Tazegul of Germany and Spaniard Rosanna Simon Alamo. "I've only been in the British Academy for four months so it's a great start." On Saturday the main focus will be on the men's -80kg division which arch rivals Lutalo Muhammad and Aaron Cook could go head-to-head. The pair were embroiled in a bitter battle for a place in the London Olympic squad, which Muhammad controversially won before going on to claim bronze. They are on opposite sides of the draw so would meet in the final if both won their earlier bouts.